Highland Heather Press hopes to release its second book, R is for Renaissance Faire, on or before Shakespeare’s Birthday/St. George’s Day. This will be a simultaneous publication of both a paperback version and an e-book available through Kindle. This picture of Queen Elizabeth, two of her ladies-in-waiting, and the Pasha (an ambassador from the Ottoman Empire) is one of the pictures under consideration for the front cover. The photo of the queen’s court is by R. B. Macdonald, of R. B. Macdonald Studios, copyright © 2015. Today is January 25, 2016, which means it’s Burnsnicht: Robert Burns’ Birthday. Robert Burns was the poet laureate of Scotland, a poet, songsmith, and collector/editor of folk songs. He was born January 25, 1759 in Alloway, Scotland. He died July 21, 1796, in Dumfries, only 37 years old. In less than four decades, he did more living than most men managed in fourscore years and ten: farming, tax collecting, writing, collecting folk songs lest they be lost (and then editing and adapting them), seducing servantmaids and farmgirls, socializing with the intelligentsia, and offending the religious establishment. His birthday is celebrated around the world with haggis, whiskey, poetry readings, and dancing. Today is also the birthday of singer Etta James, writer Virginia Woolf, actor Dean Jones, Philippine president Corazon Aquino, actor Gregory Sierra, mathematician Joseph-Louis Lagrange, scientist Robert Boyle, martyr St. Edmund Campion, and writer Deb Walsh, as well as many others. The first Burns song I learned, and still one my favorites, is “My Luve is Like a Red, Red Rose.” Windbourne performed it at my wedding reception. The Second Annual Mid-South Renaissance Faire will be the last two weekends of August, 8-20- 2016, 8-21-2016, 8-27-2016, and 8-28-2016, at Shelby Farms Park in Memphis, Tennessee. Drum roll, please! I am pleased to announce that Highland Heather Press has published its first e-book. 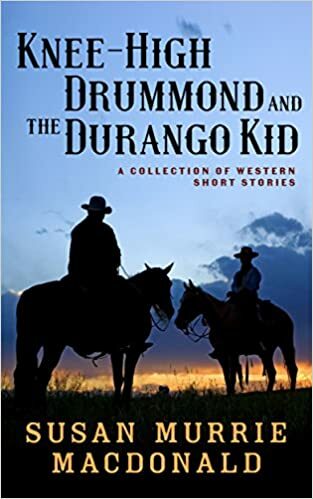 Knee-High Drummond and the Durango Kid is a collection of western short stories about a pair of outlaws who discover that trying to go straight is more difficult and more dangerous than their previous life of crime. This e-book is available through Kindle. The cover art of Knee-High Drummond and the Durango Kid is by James of GoOnWrite.com. The artwork is lovely and the artist was very prompt and very helpful. I recommend him highly for those who wish to purchase cover art or other designs. It’s back. Plasma Frequency, a magazine of speculative fiction, is off hiatus. The first story of 2016 is written by Australian writer Melanie Rees. The magazine is edited by American writer Richard Flores IV. For those interested in submitting stories or art, click on these links.